Medi-Lexico -is a series of 4 mobile applications available on iOS and Android platforms, smartphones and tablets. Medi-Lexico – is a lexicon of French and English medical terminology, which includes audio clips, allows you to find a specific medical term and listen to its pronunciation, communicate with more confidence and improve your vocabulary. These applications are intended for French and English healthcare professionals and students, who can access them at any time: no download is required after installation; versions are adapted to different media (tablets and smartphones) and optimized for both platforms, downloadable from Google Play Store and the Apple Store. An intuitive search engine allows, at all time, to quickly find your searched words, check their translation, listen to them and add them to your favorites. These applications have been designed by professionals who have targeted commonly used medical terms. This free app offers a general anatomy, allowing users to practise any time and at temps their French anatomy vocabulary. 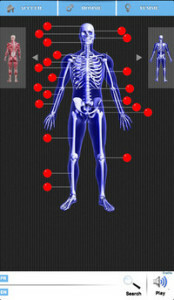 The different sections are: muscles, bones and skeleton, teeth: this interactive app offers 210 audio clips.